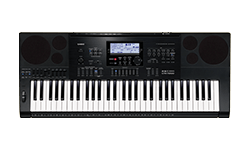 The visual learning system of the CASIO Lighted Keys keyboard is based on established principles from the field of music education. Functions such as Music Challenge provide added motivation to get playing — why not try them out at the retailer! The beginning is always difficult and practice makes perfect. If you want to learn a keyed instrument, you don’t just need diligence and endurance when practising, but also small successes in order to stay motivated. In order to make it easier for beginners take their first steps into learning a new a keyed instrument, the manufacturers of keyboards have let the inspiration flow - which is why CASIO developed its keyboards with lighted keys specially for the target group of beginners and music students. CASIO illuminated piano keyboards have an integrated function for learning songs and pieces of music with the help of pre-programmed, illuminated keys. Thanks to a unique concept based on the latest pedagogical findings, beginners can play short pieces after just a few hours, or accompany other musicians, on lighted key keyboards by CASIO. The keys that need to be played are not shown via a traditional display, but directly on the keyboard. Depending on the modern, up to 10 keys can light up at the same time, so that even challenging pieces of music can be played. On a CASIO keyboard with lighted keys, music lovers can find the ideal instrument for learning to play and seeing their first successes. Advanced amateur musicians can also improve their craft by using illuminated piano keyboards. CASIO Music has a wide range of CASIO keyboards with lighted keys. Those interested in lighted key keyboards can find information on individual instruments here. With the help of the integrated CASIO dealer search you can find out where your nearest retailer is. There, you can get a consultation and demonstration on the numerous functions of CASIO lighted key keyboards. Although they are mainly designed for beginners and ambitious amateur musicians, CASIO keyboards with lighted keys match up well to classic CASIO keyboards when it comes to sound, tone, and functionality. They are extremely light, transportable, and can be used in many different locations. Even a wireless battery is possible so they can be used anytime, anywhere. As well as integrated metronome and autoaccompaniment, where the player can be accompanied by up to 200 different rhythms, the CASIO instruments have countless other features. 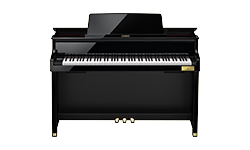 The 61 piano-look lighted keys react to touch, meaning different volumes and sound changes are produced. Depending on the model, there is a 48-note polyphony, up to 600 tones and various one touch presents, configuring the instrument for certain genres at the touch of a button. Sequencers, various sampling functions like an arpeggiator producing similar and repeating sounds, are other functions that professionals love. Keyboard players can also create and remix extraordinary dance tracks by simply pressing a combination of keys. With the lighted key keyboards, special attention is paid to perfecting the learning and practising functions. Around 100 practice pieces are contained in the set-up of the CASIO lighted key keyboards. With Step-Up, Lesson Lite, and Step-Up Lesson, there are practice systems for different levels, while Music Challenge motivates you when practising and playing. The player can also switching off the key illumination, leaving the notes to display, allowing them to improve play independently. CASIO keyboards are mainly in the lower and middle price categories, and can be found at your local retailer. Take a look, have a consultation, and discover the possibilities of CASIO lighted key keyboards for yourself.